California-based artist Samuel Yates, whose work has been described as simple ideas taken to an extreme, formal limit, will be working with Texas A&M students this coming spring as the College of Architecture's Artist in Residence. He'll be making frequent trips to College Station to work with students in the three-hour credit class, "New Genre Sculpture: Building Social Objects," said Carol Lafayette, AIR chairwoman and associate professor of visualization. "When he's not on campus, he'll be keeping in touch through Skype." 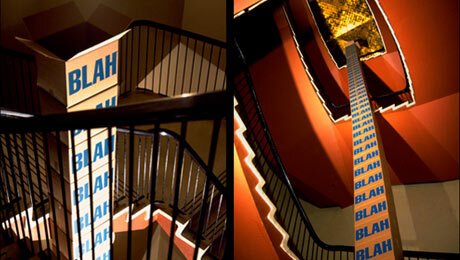 "UNTITLED," an installation by Spring 2010 artist in residence Samuel Yates (pictured above), utilizes 50 medium size brown cardboard boxes stacked on top of one another. The work towers prodigiously through the stairwell of the building, rising to a height of 56 feet. The top box is popped open--nothing inside. The face of each box is silk-screened in powder blue and in bold text, a single word reads, "BLAH," and again "BLAH, BLAH, BLAH." A former environmental design student from Texas A&M who has designed homes for some of Hollywood's biggest stars will be a contestant on a reality show debuting in December. David Applebaum will appear on Bravo's new series, "Launch My Line," as one of 10 professionals highly regarded in their respective fields, teamed with 10 established fashion designers; at the series' end, a clothing line from the winning team will be launched. "It's quite compelling television," said Applebaum, "if you like design, and the competition of other contestants trying to figure out how to make a design that's lovely, and works, and will win, and getting to know a whole bunch of different, crazy people." 2009 Outstanding Alumni: Back row: Lars A. Stanley '74, Nancy T. McCoy '81, Robert B. Hunter '67, '71, James R. Foster '66, '69, Anthony P. Schirripa '73, James C. Snyder '78, '80; Front row: Lauren Williams (who accepted the award for her father, Keith Williams), Shelly Potter '78, Jeffery T. Potter '79, Donald Austin '52. Norfleet Bone '23 received the award posthumously. Eleven former students from Texas A&M's College of Architecture were honored as 2009 Outstanding Alumni during a banquet at the Miramont Country Club. "It's the highest honor the college bestows on its former students," said Jorge Vanegas, dean of the college. "Through the generation of new knowledge and innovations, supported by extraordinary talent, abilities and skills, and fueled by a relentless pursuit of excellence, these honorees have advanced their disciplines and their organizations." A book by two architecture professors at Texas A&M, detailing best practices in intensive care facility design, has been published by Architectural Press. 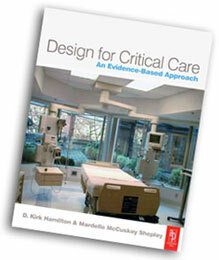 "By making the connection between research evidence and design practice, Hamilton and Shepley present a holistic approach that outlines the future for successful design for critical care settings," according to the publisher's cover notes. It's a thorough and insightful guide, the notes continue, focusing on design that has been successful and beneficial to both hospital staff and hospital patients. Seven students in the College of Architecture have joined a select group of Aggies with their acceptance into the Undergraduate Research Scholars. The program gives students an opportunity to present their work to the research community as authors, provides experience for graduate or professional school and makes students more competitive for national fellowships. In the publication, “Contractor’s Manual for Building Information Modeling,” associate professor Julian Kang and fellow authors Swapna Biju, a construction science graduate student, and Jin-Hoon Lee, an architecture graduate student, created a step-by-step BIM guide for firms in the Department of Construction Science’s Construction Industry Advisory Council. “From computer hardware setup, to software installation, to using a BIM model for construction planning and project control, the manual enables CIAC members to start using BIM to improve the construction project delivery process,” said Kang. A new set of award-winning educational videos addresses a problem an associate professor of architecture at Texas A&M discovered when she visited 68 randomly selected U.S. residential facilities for senior citizens. 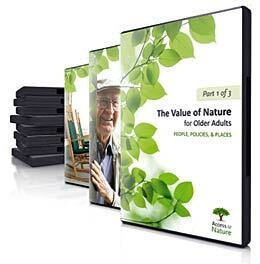 Susan Rodiek created and served as program director for "Access to Nature, Planning Outdoor Space for Aging," a three-DVD set developed at the university's Center for Health Systems & Design that provides information to help care providers, policymakers, educators, designers and consumer advocates create healthy, inviting outdoor environments for seniors in residential settings at all levels of care. Television viewers tuned to CNN Oct. 13 saw a lengthy video detailing the latest ideas in sustainability from a professor at Texas A&M's College of Architecture. CNN reporter Ed Lavandera spent a day with Pliny Fisk, an associate professor of architecture and landscape architecture & urban planning, at Fisk's Center for Maximum Potential Building Systems near Austin. “Fisk's mission," reported Lavandera, "is to develop environmentally sustainable building materials and to change the way we build our communities, like homes and office buildings." The forthcoming issue of Built Environment journal features a paper by an associate professor of urban planning at Texas A&M showing distinct variations in flood mitigation efforts by state and local governments in Texas and Florida. In the paper, "Evaluating Local Flood Mitigation Strategies in Texas and Florida," Sam Brody, holder of the George P. Mitchell '40 Chair in Sustainable Coasts at Texas A&M University-Galveston, reported his findings after analyzing 21 mitigation strategies based on the results of a survey of more than 470 administrators and planning officials located in floodplains in the two states. Faculty members from Texas A&M's Department of Architecture presented the latest findings in sustainable health facility design at two international conferences in South America. 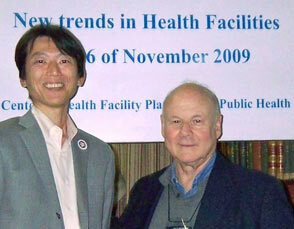 George Mann, professor of architecture, and Kazuhiko Okamoto, visiting professor of architecture, traveled to the 29th annual meeting of the International Union of Architects/Public Health Group Nov. 4-6 in Buenos Aires to present "Toward Sustainable Design in Health and Hospital Facilities." Research findings in a broad array of topics were delivered at the 11th annual Texas A&M College of Architecture Research Symposium: Natural, Built, Virtual, held Oct. 19 in the Langford Architecture Center on the Texas A&M campus. The daylong research showcase featured a series of faculty presentations previously delivered at scholarly venues around the world. This year's symposium included invited or refereed presentations and papers from the 2008-09 academic year. "The individual sessions comprising the symposium displayed a wide range of scholarship with respect to people and place," said Lou Tassinary, executive associate dean for the College of Architecture. "Fundamentally, the sessions reflected themes that have emerged in the work of the faculty and research staff over the past year." Sam Gosling (pictured above), a nationally renowned researcher and author who focuses on issues related to personality and social psychology, delivered the keynote address at the 11th annual College of Architecture Research Symposium. Using a Wii controller, Bill Jenks, assistant head of the Department of Visualization at Texas A&M, becomes immersed in the rain forest visualization exhibited at SIGGRAPH 2009 in New Orleans. Looking on is project collaborator Ann McNamara, assistant professor of visualization. The Chronicle of Higher Education took note of an immersive environment created by faculty at Texas A&M's Department of Visualization, and its possible applications for natural science museums. "With 3-D glasses, a semicircle of screens, surround sound, and a Wii video-game controller, users can experience the ultraviolet vision of a bird or the ultrasonic hearing of a whale, while navigating through a virtual world," said the Chronicle's Ben Terris in an Oct. 12 posting about the environment, "I'm Not There." 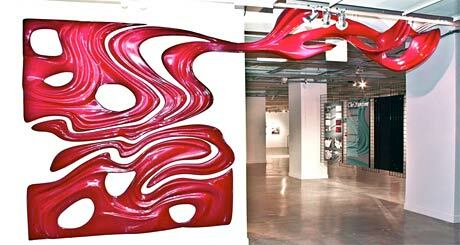 "Malbec," a "digital storefront" created by Gabriel Esquivel, is part of an exhibit in a gallery at Ohio State University. An installation created by assistant professor of architecture Gabriel Esquivel at Texas A&M is part of an exhibition exploring innovative design concepts at Ohio State University. Working at the College of Architecture's Digital Fabrication Facility, aka the Architecture Ranch, Esquivel created "Malbec" with student help. The digital storefront, he said, was inspired by the idea of rustication — defined as cutting or shaping so as to create a bold textured look. A competition to redesign a third-floor review space in Langford A is open through Dec. 18. Contest organizers are looking for improvements that address space definition, noise control and lighting. College of Architecture students at Texas A&M are eligible to compete for cash prizes in an interdisciplinary design contest to improve the review space in Langford A 300. Proposals will be accepted until noon Dec. 18, with winners to be selected in three categories: innovation, best problem solving and presentation/communication. Each winning entry will receive $250. Design ideas that are selected for implementation will be recognized as part of the new construction. Students in Texas A&M's Architecture-For-Health studio unveiled their designs Dec. 2 for a proposed New Orleans hospital that will serve an area hard hit by Hurricane Katrina's floodwaters. 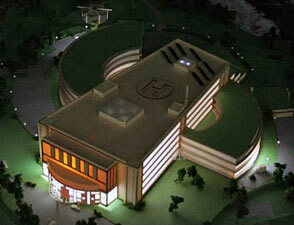 "Students have created designs for a 90-100-bed facility with an emergency center, surgery unit, intensive care units for adults and children, a post anesthesia care unit, radiology department, and a lab for blood and tissue analysis," said Joseph J. McGraw, architecture professor emeritus and former faculty member at the college. Plans for the facility, he added, are a beacon of hope for the revitalization and growth of the community. Reviewing student work are, from left, Gabriel Esquivel, Mark Foster Gage, Brennan Buck, and Weiling He. Gage later spoke as part of the architecture lecture series. Mark Foster Gage, principal at Gage-Clemenceau Architects, reviewed student work and appeared as part of the Texas A&M Department of Architecture lecture series Nov. 16. Gage's firm engages the continuing role of computation in generating new formal and aesthetic genres for architecture. 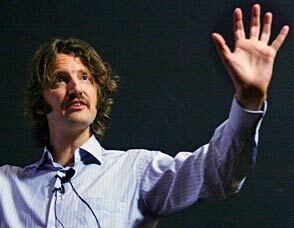 He's also an assistant professor at Yale University School of Architecture. Thanks to a Texas A&M Department of Visualization staffer, web surfers can get a unique, high-resolution look at the crowds at two of the Aggie home football games this season. Glen Vigus (pictured), senior visualization production specialist, has created panoramic photos of fans in the student side, west side and The Zone in his Kyle Field Panoramic Project. "It takes 5 minutes to shoot, but over an hour to process and put all of the photos together," Vigus told The Battalion's Carrie Johnson. "There are over 144 photos just for the alumni side alone." A screen credit in the new animated feature, "Disney's A Christmas Carol," went to Michael Catalano (pictured below), an undergraduate Texas A&M visualization student who worked on the film during an internship last summer. The voice of the miserly Ebenezer Scrooge, above, is furnished by Jim Carrey. Photo 2009 ImageMovers Digital LLC. An undergraduate in Texas A&M's visualization program received a screen credit for his work in "Disney's A Christmas Carol," the latest movie adaptation of the Dickens' classic holiday tale. Michael Catalano (at left) worked as an assistant technical director in the movie's production technology department. During the summer, he did an internship with ImageMovers Digital, a studio operated by "Carol" director Robert Zemeckis in conjunction with Walt Disney Pictures. I had a chance to talk with Michael's supervisor at ImageMovers and he only had great things to say," said Tim McLaughlin, head of the Department of Visualization. Catch up with your old classmates in the archone. newsletter’s Class Acts section, a regularly updated list of recent activities reported by former students of the Texas A&M College of Architecture. Class Acts highlights professional achievements, as well as marriages, births, retirements and just about anything College of Architecture graduates care to tell their old friends. In addition to the former student news briefs listed by class year, each semester’s Class Acts section also offers more detailed features on former student activities. The college encourages former students to use Class Acts to report news of interest or professional achievements and to update their contact information so they keep abreast of college activities of interest to them. Former students can report news and update their contact information online at archone.tamu.edu. While there, please remember to enter your current e-mail address. To save funds, as well a few trees, the college is relying more and more on electronic communications. Two of the top 10 businesses in the 2009 Aggie 100 list of the fastest-growing Aggie-owned or Aggie-led ventures, are among the nine companies led by former students from Texas A&M's College of Architecture. The college former students who made the list, their businesses and their 2009 Aggie 100 rank: James P. (Bo) Miles, president, owner, founder of J.P. Miles Construction Corporation (6); Michael Schuerich, president and founder of Arch-Con Corporation (10); Brian Cole and Jesse Sandifer, co-founders, owners of Green Grass Studios (23); William P. Huddleston, director and owner of CIMA ENERGY, LTD. (25); Jay B. Carlton, president and owner of Sterling Structures (27); Kyle Biagioli, president, owner and founder of Southern Land Design Group (61); Brad Birdwell, president and owner of GR Birdwell Construction (70); Jennifer Carney, partner, owner, founder of Carney Ranker Architects, Ltd. (77) and Bob Albers, managing director of Project Solutions International Co., Ltd., (100). A book by Frederick Giesecke (pictured), founder of Texas A&M's architecture program, is part of a former student's reference book collection recently donated to the College of Architecture's reference library. Charles S. Carleton, who earned a bachelor of architecture degree in 1947, then had a lengthy and successful career, died in 2006 at age 94. 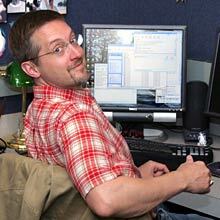 His son, Robert, donated the collection Nov. 4 to the college's Technical Reference Center. "Dad would be very happy if he knew something of his was back on campus," said Robert. A Texas Architectural Digest's "Designers' Own Homes" series in September featured a home designed by Nunzio De Santis, an alumnus of Texas A&M's College of Architecture. TEX-FAB, a new resource for designers, academics, fabricators and students seeking innovative applications of digital technology to the physical environment, is hosting its inaugural digital design workshop for students and professionals Feb. 4-6 at the University of Texas at Arlington School of Architecture. Scheduled to lead conference sessions are Andrew Payne, founder of Lift Architects, Marc Fornes, founder of theverymany, a design studio and collaborative research forum, and Rajaa Issa, a software developer with Robert McNeel & Associates. 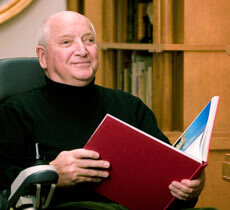 Michael Graves, hailed by a New York Times critic as "truly the most original voice American architecture has produced in some time," gave a special guest lecture on Dec. 3 at the Texas A&M College of Architecture. The acclaimed designer looked back to his student days at the American Academy in Rome and tracked the formative influence that experience had on his designs of cities, buildings and everyday objects. A sketch posted on Facebook by a visiting assistant professor at Texas A&M’s College of Architecture has become the cover illustration for a novel to be released in 2010. “I created the sketch without any knowledge of the book or the intent to do anything more than eventually create a painting from it (the drawing),” said Russell W. Reid. After the sketch was posted, said Reid, it was “discovered — someone forwarded it to someone who forwarded it to someone else." Melinda Randle, assistant to the head of the Department of Architecture, was presented with the President's Meritorious Service Award during a Dec. 1 ceremony at the Annenberg Presidential Conference Center. Randle, who has been a college staffer for 15 years, was one of 25 university staff members to receive the award. She and her fellow honorees each won a $700 cash award, a commemorative plaque, and a gold lapel pin. Since launching last year the College of Architecture’s Facebook page has amassed more than 1,600 fans. College faculty/staff celebrate season: The annual holiday party for College of Architecture faculty and staff will be held 6-10 p.m. Friday, Dec. 4 at Murphy's Law, 107 North Main Street in historic downtown Bryan. Ph.D./MSLD Accreditation Team Reception: Slated 4 - 7 p.m. in Langford B Exhibit Hall. For more information, contact Debby Bernal at dbernal@tamu.edu. 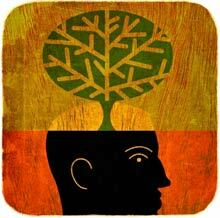 Emerging Green Builders meet 6 – 8 p.m. Wednesday, Dec. 9 in Langford C111. Emerging Green Builders are students and young professionals dedicated to becoming and recruiting the future leaders of the "green" building movement. EGB groups around the country offer young people the opportunity to get involved in "green" building locally, gain access to U.S. Green Building Council resources, and participate in local events. For more information, contact Kaushik Ganesh at koushik1904@neo.tamu.edu. LAUP Faculty meets 10:30 a.m. – noon in Langford C 207. For more information, contact Debby Bernal at 979.845.1019 or dbernal@tamu.edu. Commencement Convocation: Dr. Dudley Herschbach (pictured), Nobel Prize winner in Chemistry, will speak at the Commencement Convocation set for 5:30 p.m. Thursday, Dec. 17 in Rudder Theatre. For more information contact Ann Eastwood at aeastwood@archone.tamu.edu. Graduation Honors and Recognition Ceremony for graduate students and undergraduate honors students graduating from the College of Architecture will be held 3 p.m. Dec. 18 in the Preston Geren Auditorium. A reception will follow. The Texas A&M graduation ceremony for College of Architecture graduates begins 7 p.m. in Reed Arena. For more information, contact Ann Eastwood at aeastwood@archone.tamu.edu. AIAS Architecture Career Fair is slated 8 a.m. – 5 p.m. Wednesday, Feb. 3 through Friday, Feb. 5 Langford A Atrium, the Wright Gallery, and Langford B Exhibit Hall. For more information, contact Jennifer Branham at jennlee7@gmail.com. LAUP Career Fair Pizza Social will be held 5:30 - 8 p.m. in Langford B Exhibit Hall. For more information, contact Thena Morris at 979.458.4306 or t-morris@tamu.edu. 35th Annual ASLA Workshop: Luminary speakers, design charettes and roundtable discussions highlight Aggie Workshop 2010, the 35th annual three-day conference organized and hosted by the Texas A&M student chapter of the American Society of Landscape Architects. 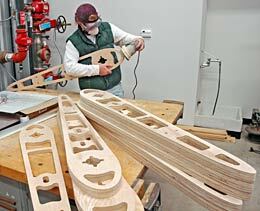 The 2010 Workshop is slated Feb. 11-13 at the Langford Architecture Center on the Texas A&M campus. As in previous years, the event will attract students, faculty and practitioners from across the state. For more information, please contact Tom Woodfin at woodfin@tamu.edu. LAUP Career Fair will be held 7 a.m. – 5 p.m. Thursday, Feb. 11 in the Langford A Atrium and Wright Gallery with lunch in 11 a.m. – 1 p.m. in the Langford B Exhibit Hall. For more information, contact Thena Morris at 979.458.4306 or t-morris@tamu.edu. Construction Science Career Fair – Session I is slated 8 a.m. – 2 p.m. Thursday, Feb. 11 at the Brazos County Exposition Complex. The purpose of the career fair is to help students secure full time positions and internships with Construction Industry Advisory Council members. The event is open to construction science students and CIAC members only. Interviews will be held from 2:30 – 5 p.m. on February 11 and from 8 a.m. – 4 p.m. on Friday, February 12. Aggieland Saturday: The College of Architecture will join the campus community offering an event-filled program for prospective students and their families. Activities are scheduled 8 a.m. – 5 p.m. in Langford A Atrium, the Preston Geren Auditorium, the Langford B Exhibit Hall, and Langford C105, 207 and 307. For details, contact Ann Eastwood at aeastwood@archone.tamu.edu. Construction Science Career Fair is slated 8:30 a.m. - 5:30 p.m. in the Langford B Exhibit Hall and the Langford A Atrium. For more information, contact Shelley Smith at 979.862.7354 or shelleysmith@tamu.edu. Historic Preservation Symposium, an annual event hosted by the Center for Heritage Conservation, is slated 6 a.m. – 7 p.m. in the Preston Geren Auditorium. The Department of Architecture Scholarship Banquet takes place 6 -10 p.m. Friday, April 16 at Pebble Creek Country Club. For more information, contact Hala Gibson at 979.845.0129 or hgibson@tamu.edu. Rowlett Lecture 2010 will be 1-5 p.m. April 23, 2010 in Rudder Auditorium. For additional information, contact Susie Billings at 979.847.9357 or sbillings@archmaiil.tamu.edu. 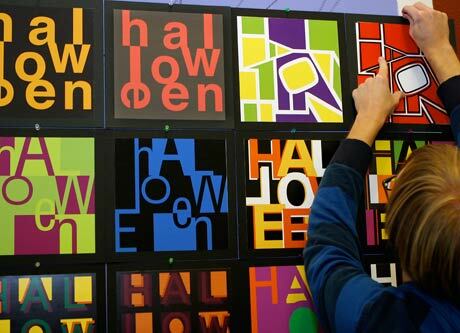 Students in a graphic design class led by Donna Hajash, senior lecturer in visualization, tacked their typographic expressions of the word "Halloween" to a first-floor wall of Langford A. Each student created three closely related 9-inch by 9-inch compositions meant to appeal to individuals aged 5, 13 and 21 years old. "The goal of the project was to explore fundamental principles of typographic form, where type is regarded as an image that serves a variety of communicative purposes," said Hajash. "Students explored form and counterform, meaning, color, use of grid, hierarchy, legibility and readability, structure and composition, and the design process." See more photos.